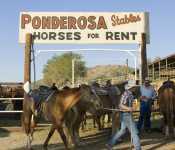 AOA has 300 bikes for rent that will fit your cycling needs perfectly. 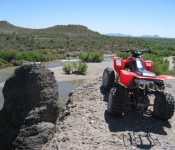 They have extensive knowledge of the local area and maps of the best mountain bike trails and road rides. 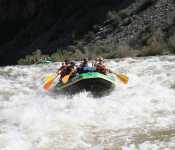 Their experienced guides can also show you their favorite routes. 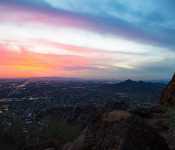 At over 16,000 acres, South Mountain Park/Preserve often is referred to as the largest municipal park in the country. 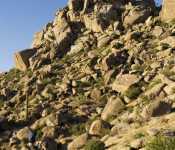 Perched atop the McDowell Mountains, the 140-foot Tom's Thumb offers hikers and climbers an opportunity for some old-time granite climbing. 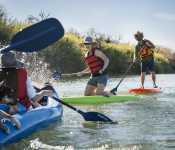 Cool off with rafting, kayaking, tubing and stand-up paddle boarding on the lower Salt River. 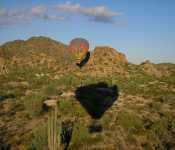 The pros at Arizona Outback Adventures will show you how it's done on half or full day excursions. 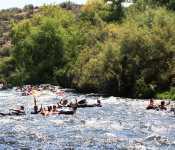 Spend the day or an afternoon tubing the Lower Salt River rapids in beautiful Tonto National Forest. 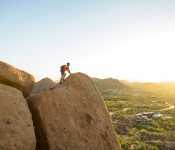 Nearly 30,000 acres makes White Tank the largest regional park in Maricopa County, it includes 25 miles of shared-use trails, ranging in length from 0.9 mile to 7.9 miles, and difficulty from easy to strenuous. 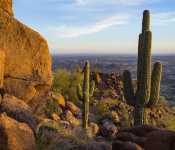 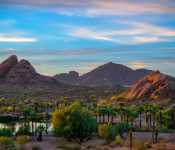 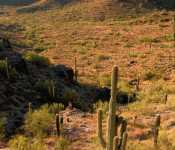 Located north of Phoenix, this 2,922-acre park sits in the upper Sonoran Desert and offers 11 miles of trails for hiking, mountain biking and horseback riding. 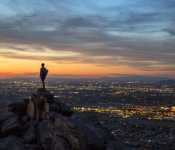 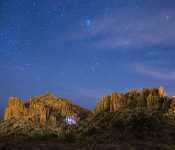 The Superstition Mountains on Phoenix's eastern edge offer spectacular outdoor recreation such as hiking and camping. 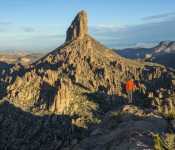 The Superstition Mountains on Phoenix's eastern edge offer spectacular hiking to landmarks such as Weavers Needle. 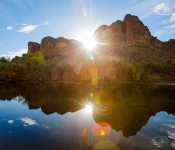 The Superstition Mountains on Phoenix's eastern edge offer spectacular hiking and recreation such as camping and lower Salt River rafting. 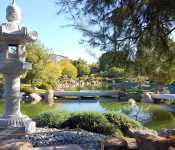 Japanese Friendship Garden of Phoenix, named Ro Ho En is an authentic 3.5 acre Japanese Stroll Garden with tea garden and tea house just north of downtown Phoenix. 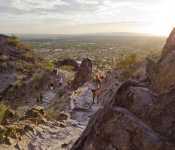 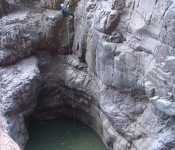 Rock climbing is a popular outdoor activity in the Greater Phoenix area. 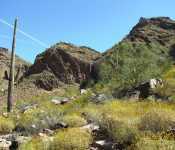 Locations like Queen Creek Canyon in the Tonto National Forest and Tom's Thumb in McDowell Mountain Regional park are popular locations. 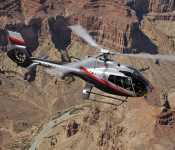 Maverick Helicopters offers a list of unique air tours for every attraction seeker including an awe-inspiring Grand Canyon helicopter tour. 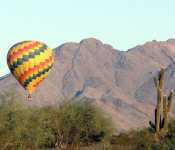 Rainbow Ryders offers balloon rides every morning at sunrise year-round, weather permitting, and Sunset balloon flights are offered during winter. 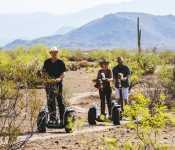 Arizona Outdoor Fun offers affordable ATV rentals, jet ski rentals, motorcycle rentals, and sightseeing tours include ATV tours and jeep tours of the historic and scenic Arizona desert. 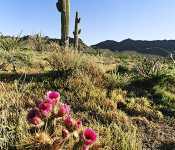 Experience the Sonoran Desert up close where you may see javalinas, desert mule deer, coyotes, rattlesnakes and others with Desert Wolf Tours. 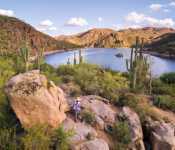 Bartlett Lake is just 45 miles from downtown Phoenix and offers boating and more water recreation on the second-largest lake in the Tonto National Forest. 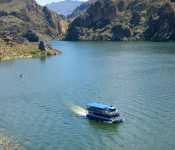 Desert Belle has been plowing the waters of Saguaro Lake for over forty years and offers 90 minute narrated public cruises. 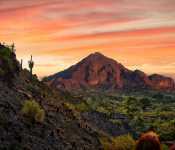 Phoenix is the gateway to Grand Canyon National Park, one of the Seven Natural Wonders of the World. 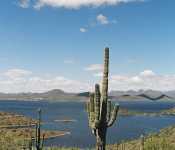 The Apache Trail runs through the Tonto National Forest along the Superstition Mountains and three desert lakes. 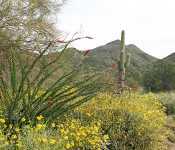 A drive along the trail is a four-hour round trip from Phoenix. 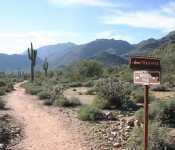 San Tan Mountain Regional Park offers more than eight miles of trails for hiking, mountain biking and horseback riding. 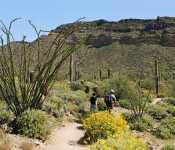 Park trails range in length from 1.1 miles to 5 miles, and range in difficulty from easy to strenuous. 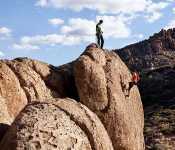 360 Adventures provides expert guides and equipment you need for canyoneering, rock climbing, hiking and mountain biking to experience Arizona's wilderness. 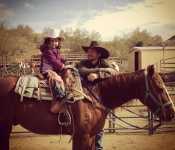 Experience the West in true cowboy style with family-friendly guided horseback trail rides. 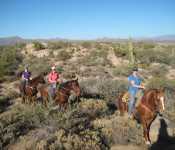 Corral West offers picturesque guided horse trail rides with panoramic views of a pristine desert preserve in Estrella Mountain Park. 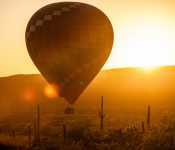 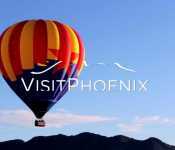 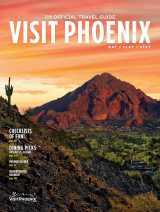 Float Balloon Tours takes you over the rooftops to the buttes and saguaros that make the Phoenix area so spectacular. 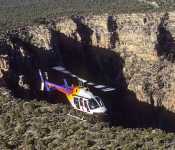 Take in the majesty of Grand Canyon National Park from the skies above it with Papillon Grand Canyon Helicopters. 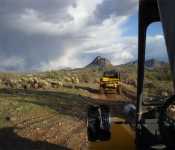 The safari comes to Arizona at Out of Africa Wildlife Park. 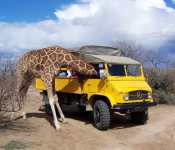 Get an up-close view of giraffes, zebras, antelopes and more. 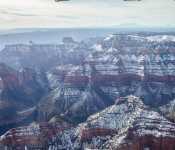 Westwind plane tours give you a unique perspective of the Grand Canyon and other attractions that can only come from a tour by air, where every seat is a window seat. 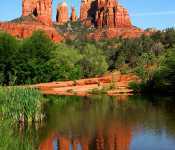 Sedona's deep red-rock buttes provide a beautiful backdrop to boutiques, art galleries and resorts.